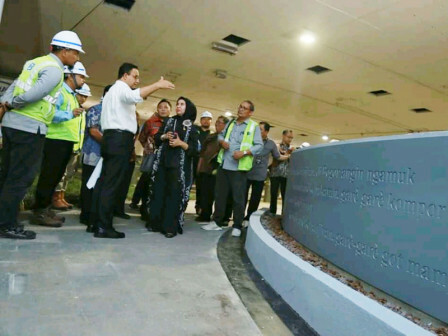 Thursday (4/11) night, Jakarta Governor, Anies Baswedan monitored construction of the Art and Culture Expression Space which is located beneath Semanggi overpass.
" It is our innovation in creating interaction space under the overpass"
According to him, sidewalk arrangement along Jalan Jenderal Sudirman-Jalan MH Thamrin will rise social interaction in Jakarta and this location is potential to be the center of it. "We want to revitalize this area to be a park where people can use it for their activities and become the Art and Culture Expression Space," he stated, as it is mentioned in Anies Baswedan official Facebook account, Friday (4/12). He informed that last night, he monitored Expression Space together with Bina Marga Department, Tourism and Culture Department (Disparbud), Transportation Department (Dishub), Communication Informatics and Statistic Department (Diskominfotik) that is being constructed beneath Semanggi overpass. "It is our innovation in creating interaction space under the overpass. After this, we also plan to manage other unused spaces under overpass," he expressed. According to him, this area will be equipped with facilities to support resident's activities. It is also planned to be integrated with public transportation and sidewalks to ensure pedestrian safety. Recently, his side has requested Ministry of Public Works and Public Housing (PUPR) to be able to use spaces underneath the overpasses such as Plumpang-Pluit overpass and Grogol-Pluit overpass to be interactive and productive spaces for local residents. "It is also to secure the space underneath toll roads from being used for undesirable things," he added.